When it comes to background screening, drug testing, and employment verification, human resource professionals, employers, business owners, and employment attorneys must keep informed of the ever-changing rules, regulations, laws, and court decisions. What are the trends facing the industry for 2018? Of those, what will have the greatest impact on the practice of human resources related to background screening? Here are Hire Image’s 2018 Top 10 predictions for what’s “hot” and why. These are topics that are sure to demand attention in 2018. One of the biggest lessons we learned in 2017 is that our personal information may not be as safe as we had hoped. There were breaches at many companies and financial institutions throughout the year, culminating with the major Equifax data breach that captured headlines in the fall. This breach was staggering not only because of the over 145 million people it affected, but also because of the extremely sensitive information, such as social security numbers, that was compromised. As our banking, business, and overall online transactions continue to skyrocket, the amount of personal information captured and stored by businesses will continue to grow in 2018. With an increase in information comes an increase in concern over the security of that information. Securely maintaining and disposing of records that contain sensitive information will continue to be a top priority for every business owner. Marijuana remains a Schedule I substance under the Controlled Substance Act, which makes it illegal for any reason under federal law. However, more than half of the states have now legalized marijuana for either medical or, the more expansive, recreational use. This inconsistency among states and, more specifically, between states and the federal government leaves many employers wondering what the changing laws mean for their existing drug screening policies. This issue was further complicated just last week by the Memorandum on Marijuana Enforcement issued by the Department of Justice, making it easier for U.S. prosecutors to enforce federal marijuana laws in states that have legalized it. Throughout the cases that have been decided (and are in no doubt just scratching the surface of this issue), one thing is clear–employers still have the right to maintain a drug-free workplace. States are beginning to step in to help define the rights of employers as they pertain to the changing drug laws. Additionally, when medical marijuana is involved, employers must also remember the Americans with Disabilities Act, which prohibits discrimination against someone with a disability. For example, in Barbuto v. Advantage Sales & Marketing LLC et al, the Massachusetts Supreme Judicial Court ruled that an employee may proceed with a claim of handicap discrimination after being terminated from employment based on a positive workplace drug test result for her off-site use of medical marijuana. Employers should also be aware that marijuana in the workforce, legal or otherwise, continues to rise. According to a study by Quest Diagnostics, the world’s leading provider of diagnostic information services, in oral fluid testing (detecting recent drug use), marijuana positivity increased from 5.1% in 2013 to 8.9% in 2016 in the general U.S. workforce, representing a nearly 75% increase. It is important that employers recognize that every state has different requirements and update their policies for each state in which they do business. When updating, clear and distinct language should be used to ensure that employees have a firm understanding of what is expected of them and the ramifications of non-compliance. 2017 saw many gender equity issues come to the forefront and we expect this powerful trend to continue, including when it comes to salary history questions during the hiring process. Several jurisdictions have passed “pay equity” laws over the past couple of years to help close the gap on equal pay and strengthen protection against pay discrimination by employers. However, jurisdictions are now taking it a step further by enacting specific laws prohibiting employers from inquiring about salary history during the interview and screening process. Massachusetts was the first state to pass legislation, in 2016, prohibiting employers from requiring salary history from applicants before receiving a formal job offer (the law actually goes into effect this year, on July 1, 2018). Last June, Oregon passed a law prohibiting employers from screening applicants based on salary history (effective January 1, 2019) and in October, California passed its own legislation (effective January 1, 2018). In April of 2017, Philadelphia became the first city to prohibit employers from inquiring about an applicant’s wage history at any stage of the hiring process (note that this law has been enjoined and is not currently effective). New York City and San Francisco followed suit by enacting similar legislation in April and July of 2017, respectively. Salary inquiry restrictions will impact many employers nationwide in 2018 and beyond as more jurisdictions look at enacting similar legislation. Employers should review their policies and practices regarding previous employment information and how employment verifications are handled. Pay equity laws could impact the screening process and policy changes may be required. Click here for a list of current Salary History laws. “Ban the Box” has been a popular subject for some time now, and while we have all discussed the ins and outs of the laws as they were intended, it appears that their adaptation and evolution will continue into 2018. As of January, 30 states and more than 150 counties and cities have now passed legislation removing criminal history questions from job applications. As the “Ban the Box” movement has grown, many of the laws now go further than simply eliminating the question about criminal conviction history from the application. Requiring an employer to wait until after a conditional employment offer is made before inquiring about criminal history and limiting the type or age of conviction records an employer can use in considering employment are just a few ways that the laws have expanded. It is also expected that many established “Ban the Box” laws will be amended to include “Fair Chance” components. Spokane, Washington is the most recent city to pass legislation, which becomes effective May 28, 2018. Employers should understand and comply with the laws in the states, counties, and cities in which they do business. Click here for a list of current “Ban the Box” laws. There is no doubt that both employers and prospective employees are using social media more and more when recruiting or looking for employment, respectively. A 2016 Career Builder Survey found that 60% of employers use social networking sites to research job applicants. This represents a significant increase from the 22% who did so in 2008. That increase in percentage, along with the increasing amount of Millennials entering the workforce demonstrates that the use of social media in the hiring process will continue to increase. For the employer, it is a risk versus reward analysis. The reward is avoiding a potentially bad hire and the tremendous costs associated with such. However, in using social media, the employer runs the risk that he or she, even unintentionally, will come across protected classes of information and then use that information to make a hiring decision. Even the appearance of a decision not to hire someone based on a negative impression related to race, gender, religion, disability, or other protected classes could subject them to a discrimination lawsuit. There is also the risk of a lawsuit for using protected activity, such as the applicant complaining about a previous employer, as a basis for not hiring someone. Other problems with the use of social media searches throughout the background screening process include the possibility of false positives or negatives. People use different names on their social media accounts and at least some information posted is usually incorrect. Employers run the risk of misidentifying someone or missing someone all together because of these inaccuracies. Finally, employers need to be concerned with the applicant’s right to privacy. It should be noted that this does not apply if the applicant’s social media settings are set to public. That information is open and anyone can look at it, including potential future employers. However, if their profile is set to private, the employer cannot try to bypass those settings without risking exposure to potential liability down the road. E-Verify is a fast and accurate web-based program that helps to ensure that jobs are only made available to those eligible to work in the country. It is currently being used by over 740,000 employers in the United States. Checking job applicant eligibility using E-Verify has been a voluntary process (except for certain employers with federal contracts) since it was created by the U.S. Citizenship and Immigration Services (USCIS) in 1996. However, the Legal Workforce Act introduced in Congress last year could change that. The goal of the legislation is to make E-verify a mandatory requirement for all U.S. employers. Mandatory use was also included in the White House Fiscal Year 2018 Budget in an attempt to reduce illegal employment. According to the Society for Human Resource Management (SHRM), there is strong support for a mandatory system among U.S. employers. A published Summary of the Act, demonstrates that the mandatory participation for new hires would be phased in gradually in six month increments, based on the number of people employed by a business, so that within 24 months, all businesses will be mandated to use E-Verify. There is no doubt that non-traditional staffing has been on the rise. A study by Intuit showed that there will be 7.6 million Americans working in some form of on-demand or freelance capacity by the year 2020. Both employers and employees tend to need more flexibility than ever. This has forced many industries to change the way they do business, while, at the same time, inspired new industries to emerge. Although not identified as employees, these contractors, freelancers, and consultants represent the companies they’re gigging for, and are often times the only “face” of the company the customer ever sees. In order to maintain the integrity of the “gig economy,” as well as the trust of their customer base, it’s up to the businesses who rely on a freelance workforce to properly vet those individuals, even when they are not defined as traditional employees. With a high turnover rate and a need for quick, efficient background checks, companies rooted in the gig economy should be prepared to adopt clear background screening protocols with a willingness to adapt the policies as local and national laws change. Employers could have the same exposure as with traditional employees and should screen them just as if they were so. 2018 will likely see the continued trend of class action lawsuits brought against employers for alleged violations under the Fair Credit Reporting Act (FCRA). Employers should not let down their guard when it comes to FCRA-related lawsuits, as plaintiffs’ attorneys will continue to creatively bring suits to show the “concrete injury” requirement established in Spokeo, Inc. v. Robins, Inc. in 2016. Last year saw cases involving Avis (paying a $2.7 million settlement in a class action lawsuit), Postmates (paying a $2.5 million settlement), and Home Depot (on the opposite side, dismissing the case for lack of “concrete injury”), among many others. Although most class action lawsuits that wind up in the news involve large, recognizable companies, employers of any size are at risk and should frequently review their forms and processes to ensure that they are in compliance with the FCRA. Employers should also review the laws in the states and cities in which they do business to ensure compliance with local laws. In addition to the restrictions placed on the type of record or age of information that employers can consider when reviewing an applicant’s criminal history, a new obstacle for background screening appears to be on the horizon. Turnaround times for obtaining information have increased substantially, as many courts no longer have the resources to help with public research. Additionally, several states are considering proposals that, if passed, would further restrict access to criminal records by imposing new rules about who can have access to court records and what information those records will contain. Under many of the proposals, date of birth will no longer display in records, thereby eliminating a key element that allows background screening agencies to validate that the criminal record belongs to the applicant in question, and making it more difficult to ensure maximum possible accuracy. 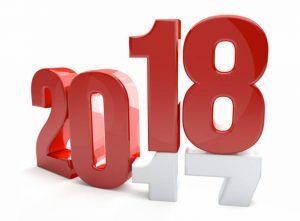 It is clear from all that is happening in our industry that the year 2018 will be a busy one in the background screening, human resources, and employment law fields. Hire Image will continue to monitor legal and regulatory developments in federal, state, and local jurisdictions and timely share those changes that impact the process of background screening.